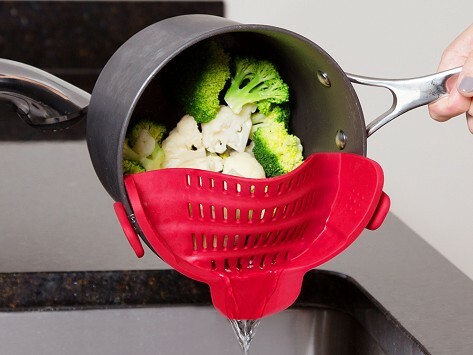 Clip this attachable strainer securely onto pots and pans to drain out liquid seamlessly. Its heat-resistant silicone conforms to the size of the container and snaps on securely, so you can tilt and pour with ease. The built-in spout gives you control of where you pour that pasta water, grease, or whatever needs draining. Plus, its compact design easily stores in a kitchen drawer. Dimensions: 9.06" x 3.74" x 2.36"
My technique of straining with either the pot lid or a plate was highly flawed. So glad to get this gadget! Works just like it should and takes up no room in the drawer. Great product - would like a larger version. Works so well. I used to use the pot lid and lost half of my pasta in the sink. And when you need to store it, this clip-on colander has a far lower profile than traditional ones. Keep it handy in a cupboard or drawer.